Ambrogio Lorenzetti frescoed the side walls of the Council Room (Sala dei Nove) of the City Hall (Palazzo Pubblico) of Siena. The size of the room is 2, 96 x 7, 70 x 14, 40 m. The subject of the frescoes are the Good and Bad Government and their effects on the life of the cities and villages. The Allegory of the Good Goverment is situated on the smaller wall opposite to the windows. The composition is built up from three horizontal bands. 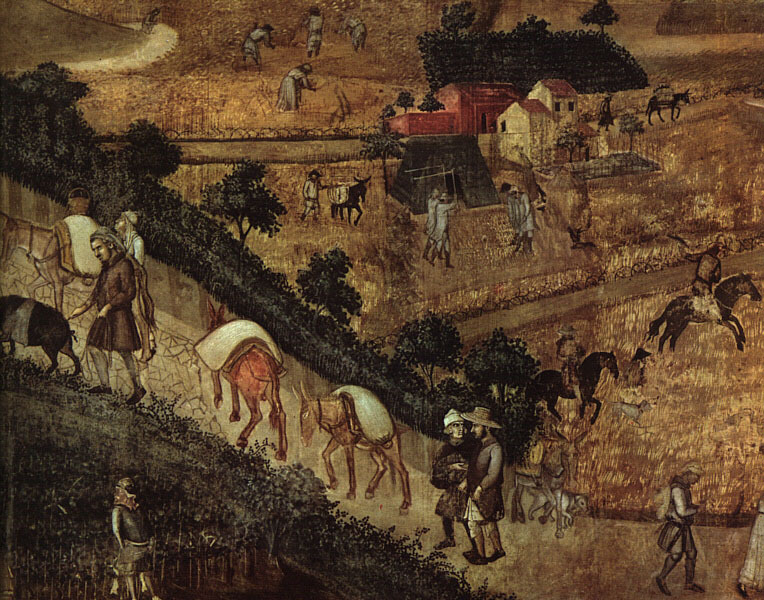 In the foreground the figures of contemporary Siena are represented. Behind them, on a stage, there are allegoric figures in two groups, representing the Good Government. The two groups are connected by the procession of the councillors. The upper band indicates the heavenly sphere with the floating bodyless ghosts of the virtues. The enthroned man on the right side of the middle band represents the city of Siena and embodies the Good Government. Around his head the four letters C S C V (Commune Saenorum Civitatis Virginis) explain his identity. At his feet the two plating children are the sons of Remus, Ascius snd Senius, the founders of Siena according to the Roman legends. On both sides of Siena the virtues of Good Government are represented by six crowned, stately female figures: Peace, Fortitude and Prudence on the left, Magnanimity, Temperance and Justice on the right. On the far left of the fresco the figure of Justice is repated as she is balancing the scales held by Wisdom.